I had never thought of it that way before. That makes that scene even more depressing. 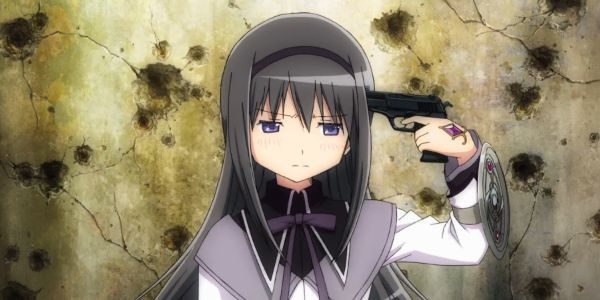 This was a really nice examination of Homura's self-hatred. There are so many ways you can interpret what the Rebellion is in this film. I'll be sad to see these posts stop end. Thank you! I feel this is the best of my Rebellion articles. I'm pretty proud of it. But to be honest, these are starting to be a struggle. I have now watched Rebellion eleven times in only a few months, and that's not even counting things like rewatching the witch transformation for this article. I'm not burned out on Rebellion, but I will be in another month of this. And besides, I've hit all the big rebellions I want to cover, except one, and I wanted to save one for the book. So here's a good place to stop, I think. I would have liked to try and write an “Against the Mouse King” and submit it as a guest post. Basically a more expansive reading of the Nutcracker analogy, in which the Nutcracker's story covers Homura's perspective of the series as well as the events of Rebellion, and even predicts future events. As an example, in this reading Kyubey sealing Homura matches up not with the Nutcracker's origin, but with the chapter in which the Mouse King demands that Marie sacrifice things to him in exchange for not biting the Nutcracker to pieces. There's also some material for analysis of Buddhist retelling of a Christian narrative in it. But when I sat down to write I encountered an old problem: I can't stand essay format writing, so much that I nearly washed out of undergrad due to failure to complete essay assignments in a timely manner. I feel like I could comfortably express the ideas in a conversational format. Would it be too much of an imposition for me to ask to chat this out with you before or after the Kill la Kill liveblog this Saturday? This sounds interesting, but I'm not available this Saturday. Can we do it the following Saturday? Yeah. I'm also open to splitting the conversation over multiple weeks if it takes too long to say it all in one go. I could not have gotten it out of my head without your reviews. I think the rebellion stuff is a little less insightful, but still offers enough food for thought to come back for more. it's certainly hard to top the ammount of extensive reviewing you gave in the first place. I personally would have loved to hear more on the author and chess pieces, but I understand that its kind of a retread. Saw the “Wheel of Fortune” one (http://flikky.tumblr.com/post/70411600875/madoka-rebellion-tarot-imagery-x-wheel-of-fortune) with the runes about The Eternal Feminine. Is the next one “Against the Patriarchy”? all of them yes, which is i linked to the master post. …Sorry, I meant the next one on The Very Soil. The whole “Against X (Rebellion)” thing. I have a passing familiarity with Tarot, but I kind of hate it and therefore haven't studied it closely. I'm not going to be covering it in the book, since I don't really have anything to add to what Flikky has to say. Sorry. I haven't had a chance to more than skim your piece, but it looks fascinating.